Khloe Kardashian did not attend her sister Kim’s 35th birthday bash yesterday, as she wanted to remain close to her ailing husband Lamar. That’s sweet to hear, and I’m happy for them both. 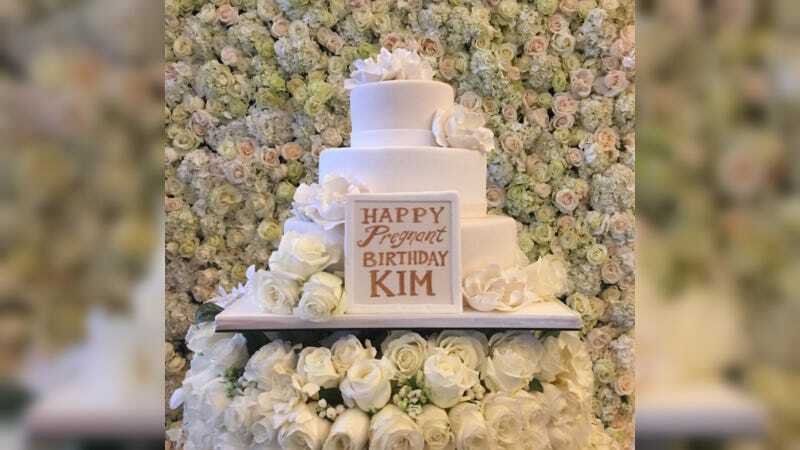 But let’s talk about Kim’s birthday, shall we? It sounds terrible. Like, truly awful. Take, for instance, the cake. Just look at that hideous thing! First of all, what the hell is a “pregnant birthday”? I know Kim’s pregnant and that it was her birthday, but are “pregnant birthdays” a thing people other than Kanye and Kim celebrate? Doubtful. So you slide it on under your clothes, walk into the lobby, and see scores of guests wearing the same bumps—each of them emotionlessly sipping expensive champagne as though being forced at gunpoint. This isn’t fun, you think. This is like being trapped in Kim and Kanye’s dollhouse. Because that’s what happened. He made all the guests watch Steve Jobs. During a birthday party. While wearing fake baby bumps. Later, Rounds said, “I feel great.” But because the two reportedly had a prenup, she probably didn’t feel as great as she could have. SARAH SILVERMAN AND MICHAEL SHEEN ARE DATING?